Heavy Duty Semi-Auto Double Miter Cutting Bandsaw (CF-810DMS) - Big Stone Machinery Co., Ltd.
For cutting any angle from 45° forward to 60° backward. The rotary center is at the intersection point of the saw blade and the fixed vise jaw. 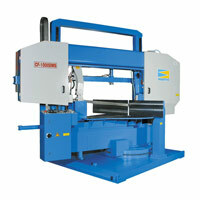 Inclination of the saw blade (5°) to reduce the initial blade impact when cutting beams.